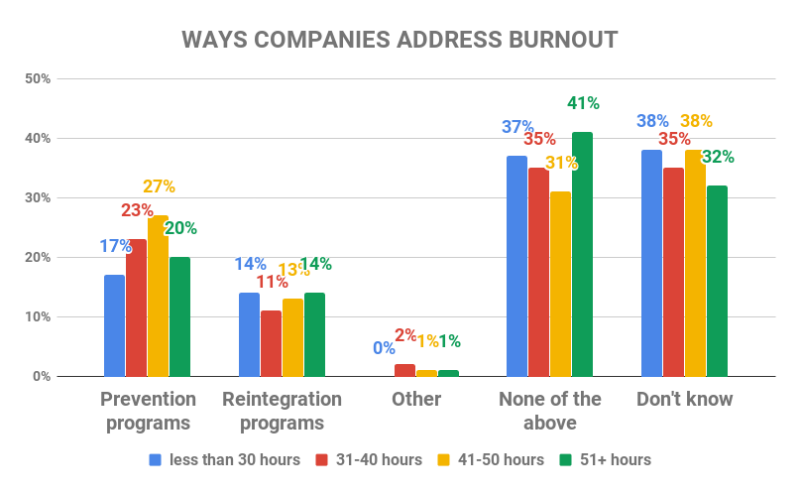 41% of people who clock in 50+ hours per week say their companies don’t address burnout, and 36% don’t know whether these programs are even an option. But, there are ways you can help yourself, once you get to know what burnout really means. According to Reddit, real people have suffered severe cases of burnout, which proves burnout is not to be taken lightly: violent daydreams, mental breakdowns and sudden resignations seem to be only half of the story. Daydreaming about getting into minor car accidents in order to rest at a hospital seems to be quite common. Imagining how it would be to fling oneself in front of a moving vehicle is another popular fantasy. One of the more severe cases is daydreaming about the elevator cables snapping while you’re riding said elevator to a high floor. Some other burnout victims have reportedly slammed their laptops in their client’s faces and simply left meetings, only to resign the day after. Others have stayed up late to finish a project, which prompted them to send in their resignations in the dead of the night. Some have left their work for lunch never to return or call again. One man had to have his colleague wrap up his files at work – he was unable to do so himself because he had previously checked in in a mental hospital. Another serious case of a mental breakdown caused by burnout was a man who started bedwetting due to stress. The most severe case seems to be connected with suicide – some just seriously considered crashing their cars, and other have jumped off roofs to their deaths. So, burnout can cause people to do and think about terrible things – but what is the medical explanation behind the term? Burnout is a physical or mental collapse, usually caused by massive stress and overwork. At first, people who burn out are chronically fatigued, have trouble falling asleep, lose their appetite, and simply cannot focus on anything. So, in an effort to work more and better, they actually ruin their ability to work at all. Physical symptoms such as chest pain, shortness of breath and dizziness are all signs the burnout has progressed. If it comes to them, you need to seek professional medical health. Burnout will also cause your immune system to weaken, so you may fall prey to various infections, colds or flues. If you’re an overachiever suffering from a mysterious cold for two long months, chances are a burnout is the hidden culprit. Your psyche takes a hit as well – at first, you feel tense, irritable, and prone to outbursts of anger. As time goes by, you start to feel anxious, lethargic, apathetic, which in the end may lead to depression. These are just some burnout symptoms – it may manifest differently in different people, so, for more information, check out this scientific overview on burnout, updated with the latest findings every two years. In recent years, the interest in burnout has increased – the ever increasing number of scientific articles, as well as the number of data collected on the subject, prove this. 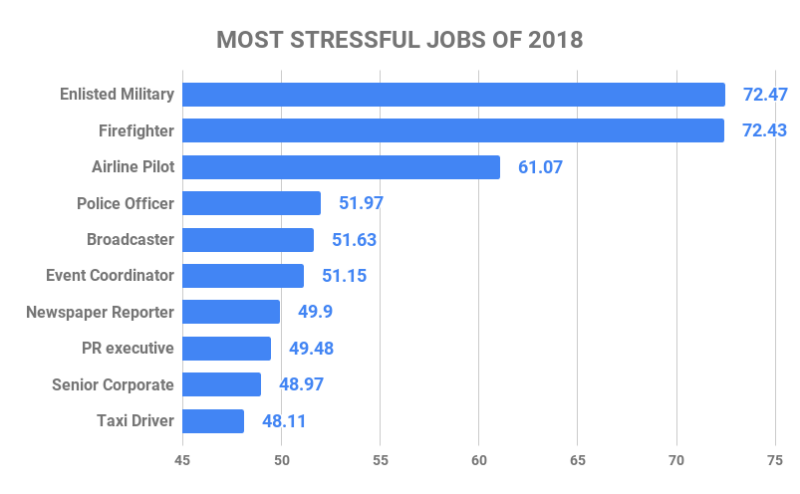 Here are some of the more crucial statistics taken from Statista, and their statistics on burnout and stress. Are people familiar with burnout? When you know what burnout is, your chances to prevent and address it increase. But, how many people are aware of this term, and what it actually means? 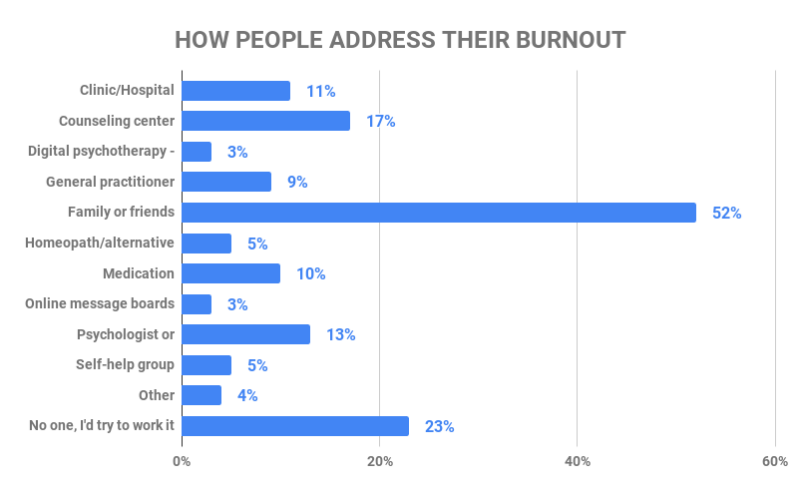 As evident, the share of adults who have heard of burnout is substantial – 79% are familiar with the term and its definition, which is great news – although an effort should be made to fully educate the remaining 21%. How many people have had contact with Burnout? Though people know what burnout is, they may not be capable of recognizing it when it happens to others – or themselves. 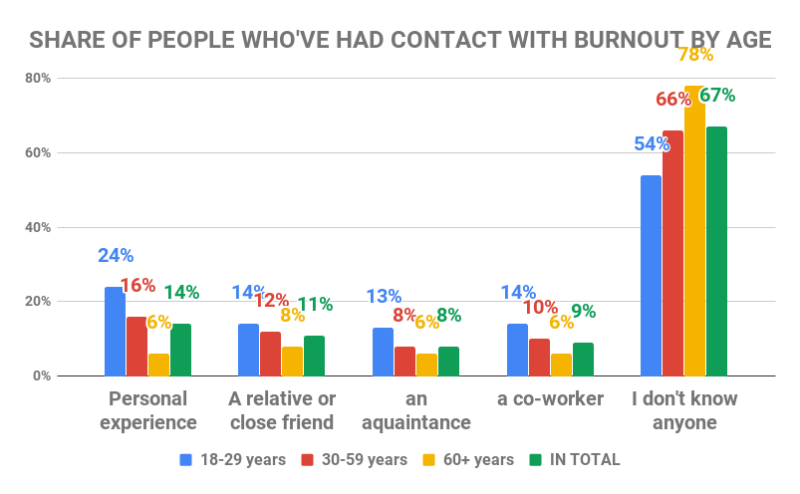 According to more research from Statista, age has an influence on whether you’ve had contact with burnout, or not. It seems that the older you are, the less you’re aware of burnout – the 60+ group holds the least share of people who have had experience with burnout, or know someone who has suffered it. In total, only about 26% from the 60+ group have experienced it, or know someone other who has, which is a stark difference to the 65% share of those aged 18-29 with the same experiences. 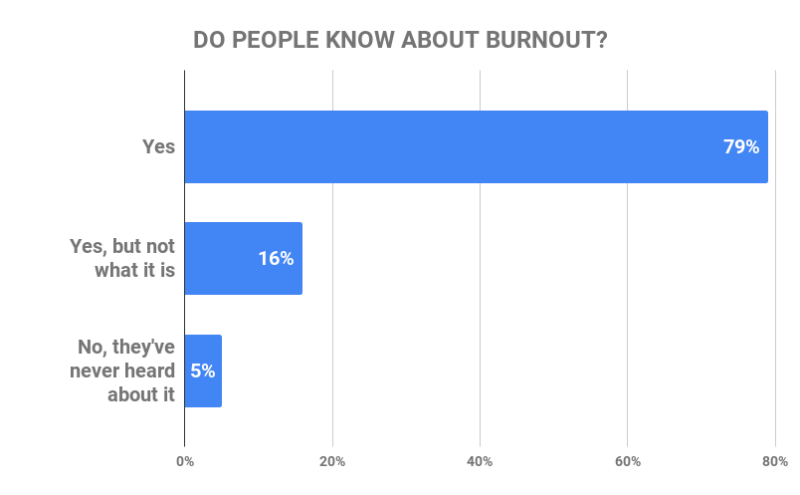 The share of people unaware of burnout cases around them is substantial – this may indicate that a lot of people who are experiencing it are keeping it a secret. Again, those aged 18-29 are most likely to have come into any contact with burnout, as opposed to the 78% of people older than 60. More than half of people from the UK (57%) have experienced burnout, while the people from the United States, with a 50% share, aren’t doing much better either. On the other hand, Continental Europe seems to have it easier, with a 30% share of adults being affected with burnout in Germany and France each. 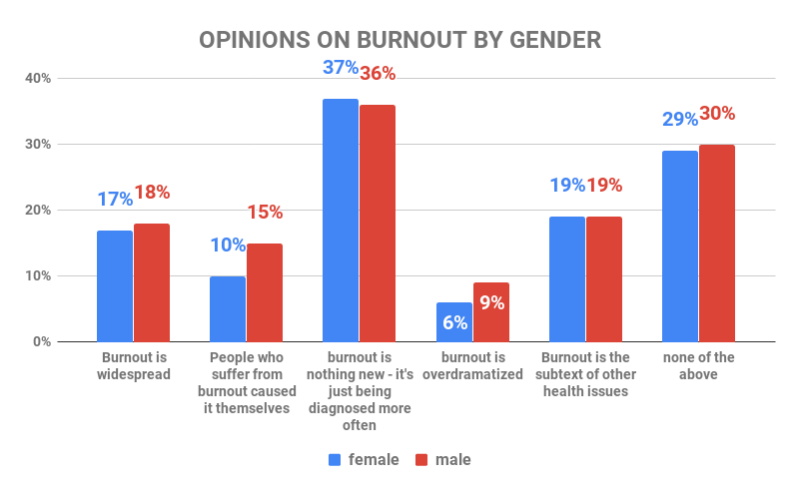 The positive data is that a lot of people (17% females and 18% males) are aware that burnout is widespread, and the majority (37% females and 36% males) believe it’s not a new condition – it’s rather being diagnosed and treated more often. Only 6% females and 9% believe it to be overdramatized – which means most people take the conditions seriously, as they should. As expected, your friends (69%) and family (63%) are the most understanding when you experience a burnout. The reactions in your company aren’t as positive – only 31% of colleagues and 27% of supervisors shows a positive reaction to burnout. How do companies deal with burnout? 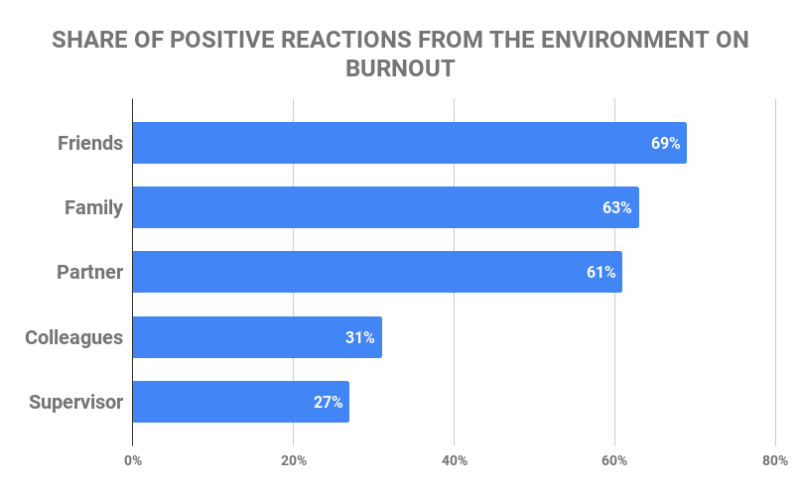 Apart from their poor reaction scores, companies don’t seem to be putting enough effort in dealing or preventing burnout among their employees. Prevention programs that include stress management and preventive healthcare are the most common type of program available – though the share of employees who have such programs available is small, with the highest share being 27% for people who clock in between 41-50 hours. Reintegration programs that include coaching and other trainings meant to help people who’ve already experienced burnout, are even rarer – the highest share is 14% for people who work less than 30 or more than 50 hours. 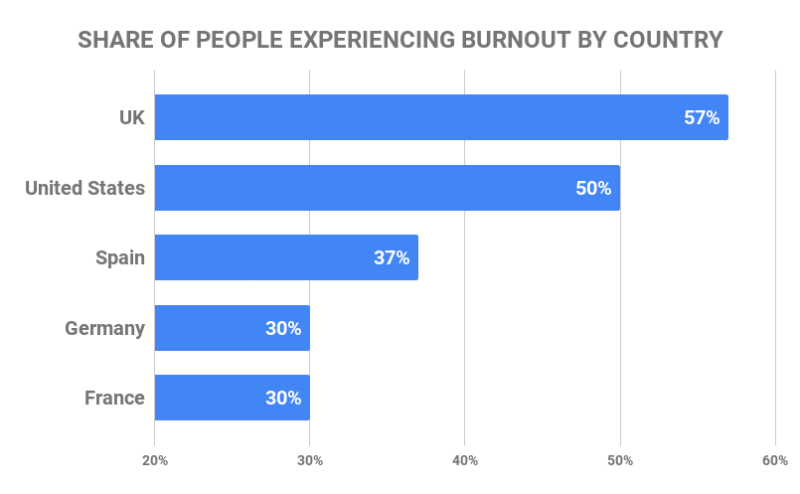 It also seems that the bigger the norm for employee hours, the lesser the chance that the company will address burnout – 41% of people who clock in 50+ hours state that their company doesn’t offer a burnout program at all, and 32% are unsure of it. Constant stress is the leading cause for burnout, and an increasing number of people today is feeling stressed over work. They perform massive amounts of work on a weekly basis, all in an effort to stay ahead of the competition – and looking up to famous entrepreneurs who claim to successfully clock in 100+ hours every week isn’t helping. 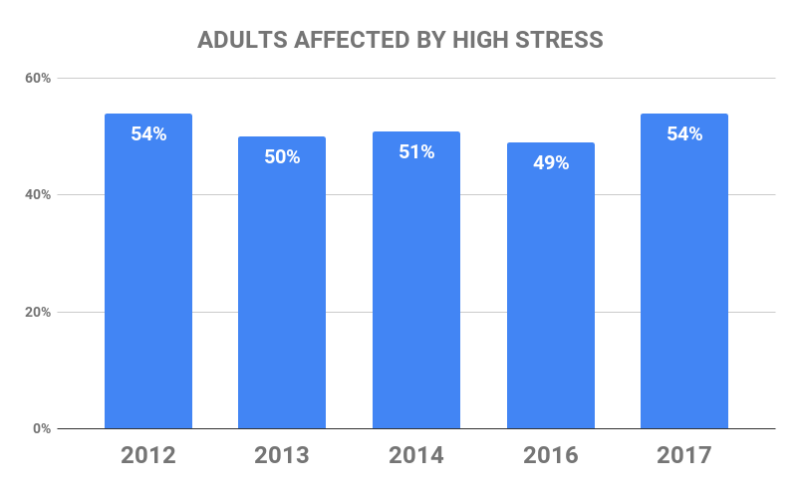 The 2012-2017 statistics from Statista shows that about half of all American adults have felt stressed during this time period. 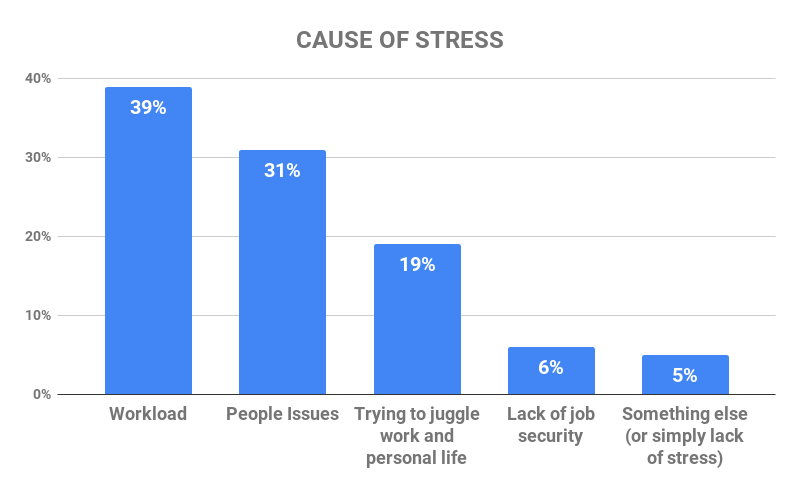 Workload takes the highest share of blame for stress (39%), although people issues are a close second, with a share of 31%. Enlisted Military Personnel (Total score 72.47) and Firefighters (Total Score: 72.43) expectedly take the lead – the list mostly alternates between professionals who risk their lives, and those who spend most of their working hours in the public eyes. Considering that they’re under a lot of pressure, these professional are often in danger of burning out. How do people affected with burnout deal with it? 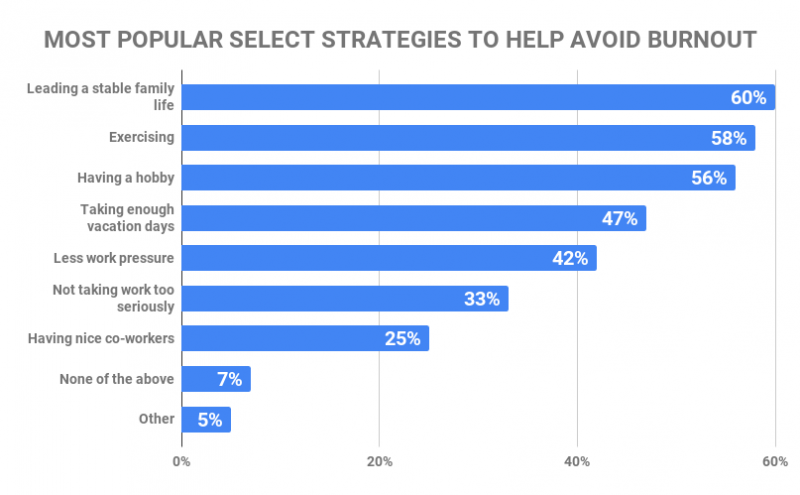 60% of US adults believe that a stable family life is the best select strategy to help avoid burnout – although exercising is a close second, with a share of 58%. In total, about 55% would also turn to a professional to treat and advise them, which is the right way to approach the matter. The alarming statistic, however, is the share of people who’d try to get through their burnout alone (23%), and the share that would immediately turn to medication (10%). Feeling powerless about your position at work is one of the biggest factors. Perhaps you have little control of what you should do – your schedule, assignments and priorities are determined by someone else, in a way that doesn’t really suit you. Or, perhaps you don’t know what is expected of you – if you don’t know what you supervisors expect, or if you’re unaware of the level of authority you possess, you’re hardly going to feel comfortable at work, which will cause you stress. Another trigger for burnout are the everyday dynamics in the workplace. Perhaps you’ve taken a job out of necessity, one that doesn’t really fit your skills or interests, and now you’re struggling to keep up. You may feel bored with your everyday work activities, so you’re constantly looking for some way to jazz things up. Or, perhaps you never really have the chance to be bored, because you’re constantly putting out fires. Either way, both extremes will quickly exhaust you, and if they’re a regular occurance, lead to burnout. The state of your social life at work, but also at home, can greatly influence your chances of burnout. Maybe you’re working in an office where someone is bullying you, or where micromanagement is a big part of your work day. Or, you don’t share the same set of values as your colleagues and supervisors – you have your own way of dealing with work, but you feel pressed to follow theirs. Maybe you feel isolated at your workplace, or in an area of your personal life, so you don’t feel up to the challenge to tackle your everyday workload. The biggest problem may be that you have no work-life balance – you spend too much time at work, so you no longer have time to spend with your loved ones, which is making you apathetic. Whatever the case may be, you feel burdened by your social problems, so you can’t focus on work with the love of devotion you could otherwise muster. And, considering you’re falling behind with your work, you’re trying to make up for it by working longer, which leads to even less time for quality socialization, and even more problems. People who’ve experienced burnout early in their careers have better chances to recover, as one study shows that early-career burnout doesn’t leave visible negative consequences – though burnout at a later stage of your career might. As stated in the aforementioned study, there hasn’t been sufficient research to single-out all long-term effects of burnout. But, another study claims that burnout and depression overlap – and, as depression is a serious condition that takes a long time to treat, burnout should also not be taken lightly. If not treated properly, depression caused by burnout may encourage you to turn to alcohol, drugs, or even attempted suicide. As Statista research has shown, one of the most widespread myths around (with a share of 47%) is that burnout can be fixed with a vacation, or some time off – but, as research shows, vacation is not a quick fix for burnout. Taking one Friday off won’t do the trick either. Burnout is a serious condition that needs to be looked into by a professional – but there are ways you can temporarily help yourself and ease your condition before taking more serious steps. Everytime you say yes to a project or request, you’re adding a new item in you’re to-do list – up until the point you double your working hours in an effort to do everything on time. It’s important that you address your priorities, and limit the number of requests you’ll tackle. It’s better that you tackle one important task a day, than to work overnight to finish three unimportant tasks. If you simply cannot say “No”, consider other options, and whether it’s even possible for you to deliver under certain circumstances. In any case, consider capabilities and make them know to the requester. Also have in mind that, while it’s usually others who overload you with work, you can also do it to yourself. If you have a number of ideas, don’t tackle them all at once – single out your most profitable ideas, and leave the rest for later. Staying motivated and positive is welcome, but if you’re exhausted, pushing yourself to power through when you can barely keep yourself from falling asleep, won’t help you. Instead, give yourself some time off – get a nap, eat a snack, go for a walk. Also, make sure you schedule in breaks and downtime – unwinding is important if you want to remain productive, but also avoid burnout. Working non-stop will make you productive and efficient for a short while – but remember that it’s almost guaranteed to make you miserable and burned out in the long run. Make sure you always leave time for a healthy diet, regular exercising, and enough sleep. Also, make sure you stay hydrated throughout the day. Although these points may seem less important when you’re pressed with a deadline, you’re not doing your health (or your productivity for that matter) any favor if your working hungry, thirsty and sleep deprived. Also, exercising may seem like a redundant and tiring addition to the mix, but there’s scientific proof, that regular exercises benefit your mental health – which makes them worth the effort. Considering burnout causes you to slip into negativity, you should aim to practice positive thinking. Try this by making positive statements about your future – considering it’s difficult to think positively when it seems everything is against you, start small. First, start by thinking something positive when you go to bed – for example, think of at least one good thing you did that day. Apart from thinking positive, spreading positivity around you will also bring you benefit, and make you feel better – you can do something nice for a coworker at the office, or take on volunteering in your spare time. When the way you address work doesn’t really mirror your work ethics and values, your stress levels take a hit. So, it’s best that you reassess your current practices, and reconsider your goals. Think about what your work means to you, and what your role at the office is – once you understand what your values are, you’ll be able to decipher what it is that is missing from your work life. Do you feel appreciated, respected, included in your company’s culture? If not, try to find a way to incorporate these missing elements to your every day. Don’t ignore your stress, but try to find a way to tackle it, and improve your mood: meditation, yoga and deep breathing exercises are all viable strategies you can try. All work and no play is bound to make you feel stressed, so make sure you reshuffle your impossible schedule to spend some time on your favorite activities. Leave time for hobbies, re-read your favorite book, listen to your favorite music. Spend some time with loved ones – you’re not likely to endure stress and burnout alone. Considering that a positive environment is best when we want people to address their problems, if you suspect a colleague is suffering from a burnout or is in danger from suffering one, don’t ignore it. First, ask them how they’re doing – this way you’re letting them know that their work environment is concerned for their well-being. Mention you’ve noticed they have changed, and ask whether there’s something they’d want to share. If they want to share with you, listen to them without casting judgement. Suggest that they also speak with a professional about what’s worrying them, so that they can get the best possible guidance and advice. This circles us back to the most important point – When you suspect you’re in danger of burnout, always consult professional medical help. These tactics can only take you so far, but burnout is a serious condition, and you should take it seriously.